The spring term has been a busy one in the Sixth Form with students getting involved in a number of activities. The term started with the fantastic news that one of our students has received an offer to study medicine. Our year 12 students are now focused on planning for their futures after the sixth form here at Christ's School and are exploring a range of exciting opportunities including Higher Education, Degree Apprenticeship and Gap Years. As well as attending the UCAS Convention at Brunel University, students have attended university taster sessions at Oriel College Oxford for medicine, Surrey University for Law and many more have visits planned for the summer term. Our Oxbridge students had a visit from Oxford University to share information on studying and applying to both Oxford and Cambridge. During the final week of term a group of these students will also be attending the Oxford and Cambridge conference in Epsom to get the very latest information from each subject on making competitive Oxbridge applications. This year we have also had a number of students interested in applying to universities in the US and Canada. We were delighted to host a talk by Latymer Upper School, one of our partner schools, on applications to the USA and Canada which is a complex process. An invaluable way to gain insight into potential careers is through work experience and with the help of Kingston and Richmond Education Business Partnership, students have been hunting for work experience opportunities for the Summer Term. Students have already secured placements in the civil service, law and engineering. More than 20 of our Year 12 students also attended the World of Work Roadshow which provided networking opportunities with employers such as British Airways, Balfour Beatty and Ernst and Young. Years 12 and 13 students have also had the chance to attend a range of career insight events hosted by leading employers. These have included Engineering, Games Development & Production, Architecture and Science. Sixth Form students, as always, have been involved in supporting our School community –indulging in a spot of healthy competition with cake sales raising a substantial amount money for Red Nose day, helping with our eSports day, running the Year 7 disco and participating in Science Week. 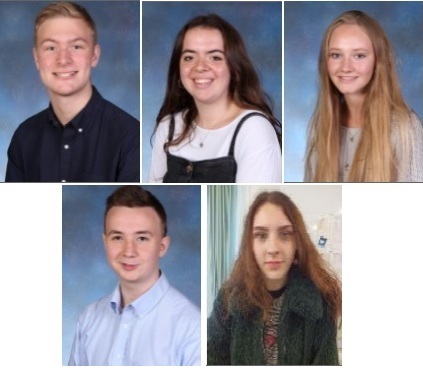 At this time of year, we thank our outgoing year 13 student leadership team, superbly lead by Sabrina Robinson, Stephen Frank, Miles Burne and Jamie-Louise Brecher, as they pass the baton on to our new head students and their deputies Louis Icke, Lucy Blitz, Alice Bowes Smith, Georgia Fitzgerald Monk and Alastair Copland (pictured above) who will, undoubtedly, bring much to these roles over the next year. All five were selected as a result of fantastic performances in a very rigorous selection process of peer interviews, Key Stage 3 hustings and panel interviews with the School Leadership Team.